Anti Bird Netting - GUACAMALLAS™, protecting your crops from frugivores. 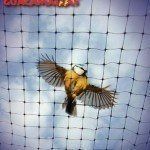 Bird Netting for Control and Protection of your Crops. Anti-Bird protection nets by GUACAMALLAS against all types of birds. Protection of orchards, vegetable crops and macro tunnels. Protection of constructions, warehouses, buildings. Protection of churches, ancient monuments. The benefits of anti-bird netting are to prevent economic losses due to reduced harvest or “dropping”´s damage to the image of urban structures such as warehouses or historical monuments. Bird protection nets even stop the spread of certain diseases carried by birds, this is especially important near your kitchen or balcony where kids play, or a food packaging plant. Flock of birds feeding on agricultural crops. One hour of sparrows can destroy many months of hard work and investments. Who would have ever said you needed bird netting! 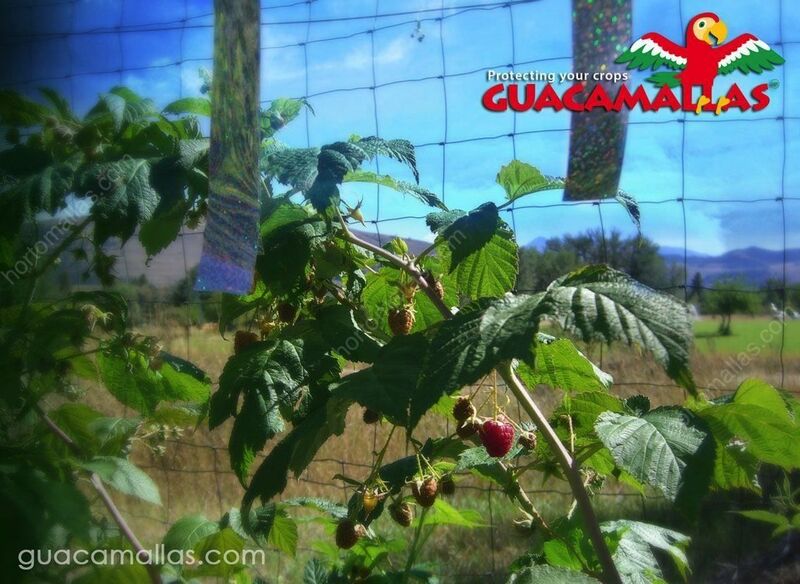 Berries protected with GUACAMALLAS bird netting will reach market safely! You worked hard all year long, you invested your savings and just as you were getting ready to harvest, as your fruits are starting to ripe and you were contacting your commercial contacts for the final delivery arrangements, here come the birds and bats and they make you waste months of work because you did not think about protecting your trees, espaliers or high tunnels with all those sweet fruits inside with GUACAMALLAS bird netting! GUACAMALLAS offers total crop protection for your fruits and sweet corn fields against the pesky attacks of frugivore birds city birds like pigeons (also known as rats with wings!) 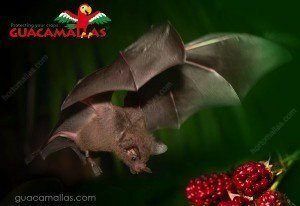 and bats. Too bad GUACAMALLAS bird netting was not in place! 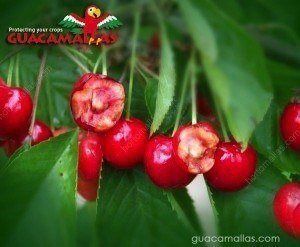 Do not let the birds take advantage of your hard work of growing fruits and grains! 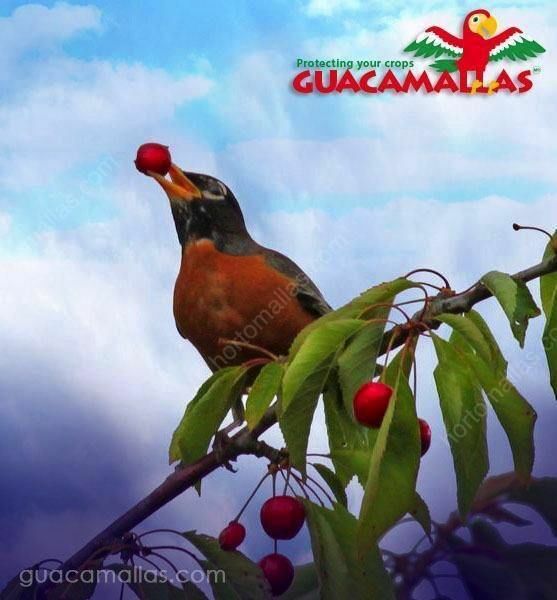 GUACAMALLAS anti bird net is the most effective method to protect your crops from hungry frugivore birds, as birds will become accustomed to noise cannons or moving strings, or even scarecrows. GUACAMALLAS avian control netting is a non-lethal barrier for volatiles (birds and bats) and will prevent them 99% from entering the area to be protected. Applied on the ventilation windows of your macro-tunnels or directly on top of the fruit baring trees, this bird barrier will allow you to harvest what you have been working all year for. GUACAMALLAS bird netting is also used to avoid wild birds from entering chicken or pig pens, where they could cause economic losses not only by eating feed designed for your farm animals, but also by bringing in diseases and pathogens to your protected areas. GUACAMALLAS anti bird net comes with a price guarantee like all other HORTOMALLAS products, so you may purchase it knowing that if you ever find a better price quote after your purchase you will be refunded any difference plus an extra as an incentive to keep us efficient. Anti-Pigeon Mesh GUACAMALLAS®. 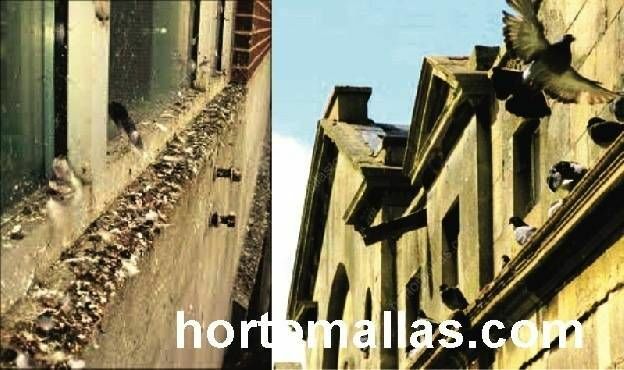 An excellent choice to protect old historical buildings from damage caused by bird droppings. Anti-Birds Mesh GUACAMALLAS, protecting your heritage. One of the characteristics of birds is that they always seek nesting in elevated areas, which is convenient to do in monuments, balconies, terraces, under roofs, among other structures. Bird colonies will leave trash and dirt in their path, and damages monuments, causing an ugly sight as buildings will look sprayed in different tones of greys and browns. 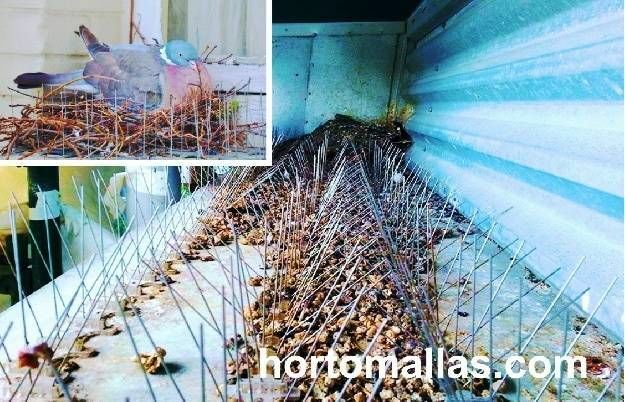 Especially city birds can be a focal point of bird borne disease; many choose to use ineffective spikes against pigeons, which only end up being used, by the same birds we are trying to repeal, as a reinforced nesting ground and even worsen the focus of infection, as injures birds as well. Nest of pigeons on a cornice covered with spikes against pigeons. 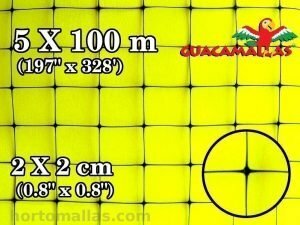 GUACAMALLAS anti-bird protection offers an effective solution to protect your buildings, bird netting is friendly with the fauna as it works as a physical barrier and blocks the entrance of birds without hurting them. Even thicker meshes like CHICKENMALLA are used to delimit areas where to raise chickens organically. Installation of GUACAMALLAS mesh in large structures like entrance halls of airports, hospitals or museums. 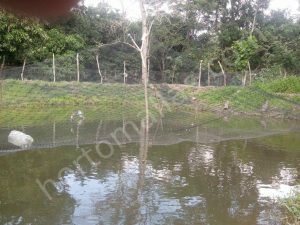 GUACAMALLAS anti-bird mesh on pond for aquaculture, protecting fish and shrimp from marauding birds like seagulls or pelicans. 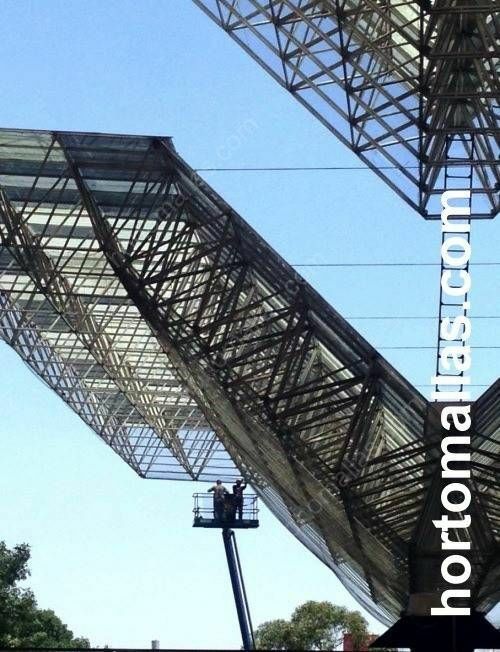 Would you like to see more pictures of GUACAMALLAS bird protection net?